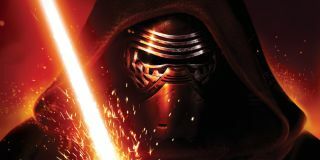 If, somehow, you haven't seen Star Wars The Force Awakens yet then knowing anything about a certain scene with Kylo Ren will be a massive spoiler. Proceed at your own peril. Here's a GIF to make sure you don't see anything accidentally. I don't think it's canon. Okay, spoilers GO: at the end of Episode 7 Han Solo confronts his son, Kylo Ren, in an attempt to bring him back from the dark side. A meeting that ends with Ren killing his father. In this commentary clip from the upcoming 3D Collector's Edition of The Force Awakens (via USA Today) director JJ Abrams explains more about that scene, pointing out that, "obviously any time two characters in Star Wars go out on an incredibly thin bridge 10 miles above the ground with no railings, it's not going to end well with one of them." Contrary to what a lot of people might have thought, Kylo might not have decided to kill Han until the very last moment. "People have asked me if Kylo Ren was playing with him the whole time. If he meant to kill him from the beginning," says Abrams. "The truth is I think Kylo Ren in this moment is actually being convinced to walk away from this. Snoke is, as Han says, using him and I think somewhere Ben knows this. But I think that he can’t accept it. Deep down, he’s gone too far." The team were apparently "working on this scene quite a bit" to get that sense of uncertainty across, which explains why it was such a shock. Well, except to me because some guy told me about it when he came out of the theatre. Thanks, guy. I'll always remember you. Directed by JJ Abrams and starring Harrison Ford, Carrie Fisher, John Boyega, Daisy Ridley, Adam Driver, Andy Serkis, Oscar Isaac and Gwendoline Christie, Star Wars: The Force Awakens 3D Collector's Edition will be available on DVD and Blu-Ray internationally on October 31 and in the USA November 15.